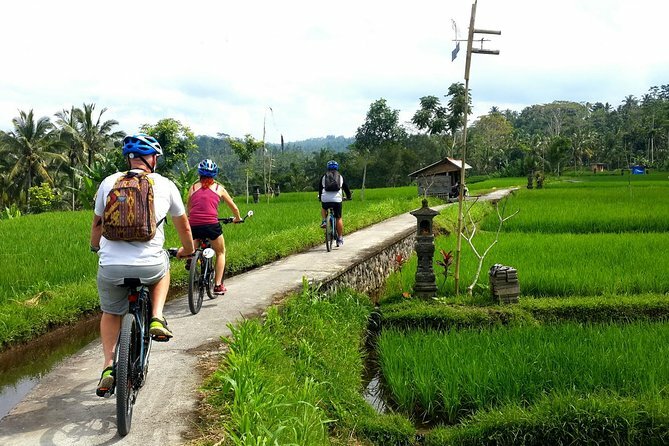 Tour Ubud on an electric bicycle! See the majestic rice terraces, explore local villages and temples. Our experienced guides will take you through a wonderland of sites and offer their insights into the local culture. Finish the trip with a delicious Balinese lunch. Experience true freedom on an electrical bicycle. Pedal as much, or as little, as you want! Amazing UNESCO World Heritage rice terraces. Local coffee plantation with zip lines and giant swing. Just the best way to ride a bike if you are not as fit as you once were, great tour guides and great tour. This was amazing! Everything was taken care of - picked up on time, small groups, great tour guides. The only caution I would provide is that this tour isnt for the faint hearted. You are biking through some pretty curvy hills with ongoing traffic, people, dogs etc. It was the best thing I did in Ubud and loved every minute of it, but just know that if you're a beginner bike rider, it may be a bit challenging. The electric bikes definitely come handy - they were a great addition! My daughter and I loved this tour! The guides were great, very informative, funny, interactive.. the bikes were the best. I've done 2 bike tours in the past using just push bikes, which were great but this time using electric bikes was the way to go :) would highly recommend this tour to anyone!! Amazing tour. E bikes is the way to go. We saw amazing sites. Got lots of times to stop and take pictures. Got the opportunity to see the famous rice terraces and stop at a coffee plantation where you had the option to do a jungle swing . Tour guides were amazing and information. Highly recommend this tour. Such a good tour, firstly the wonderful experience of the electric bikes whizzing along the countryside with no effort but also the friendly and knowledgeable guys who took us around, giving us a taste of the real Bali and lives of their communities! Highly recommended! We loved this tour! The bikes are heavy and some terrain is a little steep or narrow, so you need to be in reasonable shape to be safe. The views are spectacular, and it turned out to be a very peaceful day for us. We stopped regularly for photos and breaks. Our guides provided great information along the way and kept us safe throughout the tour. I really enjoyed this tour - the bikes were fantastic and the guide was informative and interesting. We got caught in a downpour and that only added to the adventure. I recommend this one. This was a great experience. The staff were friendly, beautiful lunch. Bikes were in excellent condition.